In French with English subtitles. Also known as Lilac. The film features a haunting performance from Marcelle Romée, a young actress who is all but forgotten today. 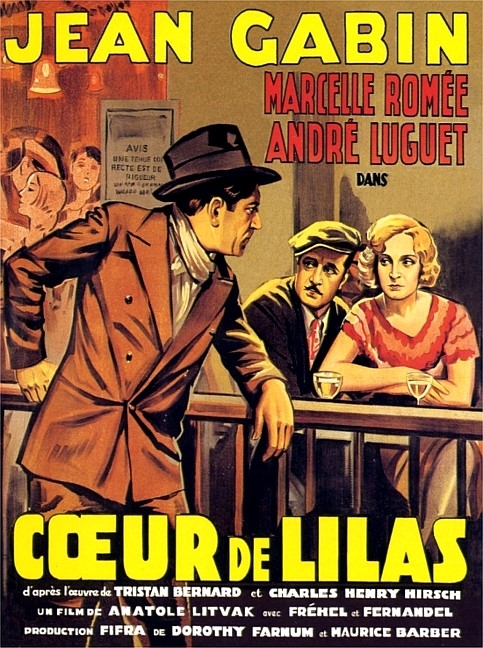 She plays the vulnerable heroine Lilas, opposite lead actor André Luguet. Romée's promising film career was cut short when she committed suicide a year after making this film, adding a tragic note to the film's poignant conclusion. Legendary actor Jean Gabin also stars in the film, a few years before he became immortalized as the popular tragic hero in films such as Pepe le Moko and La Belle Équipe. Gabin appears here in an a somewhat atypical role - a rather brutish roughneck always looking for a fight. I didn't expect much from this film and was surprised at the skilled direction by Litvak, the gripping story & marvellous acting. It has none of the static quality of most early sound films.